We provide diagnosis, treatment and after care for an array of skin conditions and have listed a small selection below. The majority of us suffer from foot perspiration occasionally but sweaty feet can be an embarrassing ongoing problem for some people. We can investigate the causes of your particular problem such as hormone imbalance or poor footwear and offer education and treatments about your condition. resulting in a rash. Dyshidrotic eczema often affects the toes and fingers, and may first appear as a reddened, slightly swollen patch of skin. 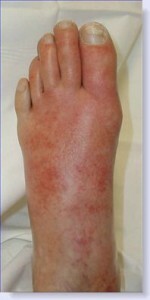 The rash can also appear on the soles of the feet. This type of eczema is usually brought on or intensified by sweat or excess moisture, and these irritated areas of skin will usually become pruritic (itchy), and may develop small blisters. We can prescribe medicinal care for this condition. The infection cellulitis is a skin infection which presents itself as a rash, appearing as a reddened, tender, and warm area of skin. It can spread quickly, leading to red streaks that move from the foot toward the leg. The appearance of streaks is known as lymphangitis, which means the infection is spreading toward the lymph nodes. A variety of types of bacteria can cause Cellulitis and lymphangitis but staph and sometimes streptococcus (strep) are the most common. Any infection, especially cellulitis and lymphangitis, requires prompt medical attention to avoid further spreading and complications. Infections can spread to deeper tissues, including bone if left untreated.